Vivekananda Kendra Kanyakumari, Branch Bina has organized “TEJAS” A PERSONALITY DEVELOPMENT WORKSHOP” for the Students of class IX of Kendriya Vidyalaya, Bina in the activity hall from 9th November 2016 to 11th November 2016 in the activity hall. Adarniya Sushree Sunita Gupta, Principle, Kendriya Vidyalaya, Bina welcomed the step of Vivekananda Kendra, Kanyakumari Bina for taking initiative for guidance of teenagers to decide their goal with patriotism. 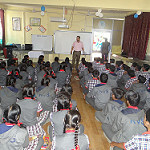 Shri Girish Kumar Pal and Shri Rahul Udainiya has briefed the students to enhance the over-all personality of the students, during the five sessions on various important issues like values in life, patriotism in practice, True passion of life and team work etc. Yoga for stress management, games for body fitness and mental alertness and more activities relating to all round development of the personality and effectively helpful to their studies. Both of them briefed about the work activity of Vivekananda Kendra in Bina and its work activities to the students. Shri Ramavtar Yadav, Karyakarta helped in management of said workshop. Adarniya Smt Sherly Verghese, Librarian, Kendriya Vidyalaya, Bina played an important role for management of this workshop in the school. 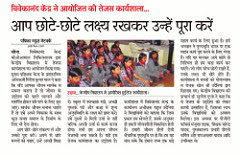 Ku Manjusha Taik, PGT, Commerce and Shri Mahendra Yadav, SST Teacher has observed all the activities of the workshop. The sole objectives of the workshop were to guides and motivate the students towards right path. And showed them theirs Responsibility towards society respectively. About 80 students were present in the said workshop. Sushree Sunita Gupta, Principle, Kendriya Vidyalaya, Bina appreciated the theme of workshop and expressed her satisfaction. She further expressed to conduct more and more activities in future for the students as well as for the teachers of Kendriya Vidyalaya.